1. Claim: "The Greenhouse Gas Bulletin showed that between 1990 and 2013 there was a 34% increase in radiative forcing -- the warming effect on our climate -- because of long-lived greenhouse gases such as carbon dioxide (CO2), methane and nitrous oxide." 0.6/342 = 0.17%, not 34% as claimed by the UN above in an apparent attempt to make it sound scary. 2. Claim: "The current rate of ocean acidification appears unprecedented at least over the last 300 million years"
The claim of "unprecedented" pH is from dicey proxy studies that are not accurate enough to detect a tiny 0.1 pH change allegedly since the start of the industrial revolution. Even direct measurements with the best pH meters available today are generally uncertain to ± 0.2 pH units. All claims about anthropogenic 'acidification' are from models, not observations, which are debunked here by Professor of geochemistry Dr. Tom Segalstad. 3. Claim: "We know without any doubt that our climate is changing and our weather is becoming more extreme due to human activities such as the burning of fossil fuels"
4. Claim: "Carbon dioxide remains in the atmosphere for many hundreds of years and in the ocean for even longer"
5. We should believe falsified climate model GIGO because "The laws of physics are non-negotiable"
Further, even if CO2 levels were surging, the globe doesn't seem to care as there has been no statistically significant warming for 18-26 years, indicating climate sensitivity to CO2 is much lower than previously believed and overwhelmed by natural variability. Climate models are incapable of determining climate sensitivity to CO2, and observational estimates of climate sensitivity are very low, thus CO2 becomes a non-problem, with the added benefit of greening the planet. 7. They did get one thing right however, admitting "It is high time the ocean, as the primary driver of the planet's climate and attenuator of climate change, becomes a central part of climate change discussions"
That's right, the Sun heats the ocean, the Sun and possibly lunar tidal forcing drive ocean oscillations, ocean oscillations then drive global surface temperatures, not greenhouse gases. Longwave IR from greenhouse gases cannot penetrate or heat the oceans, and warming of the atmosphere cannot heat the oceans because heat rises and the oceans have 1000 times greater heat capacity than the atmosphere. Game over. Summary: The amount of greenhouse gases in the atmosphere reached a new record high in 2013, propelled by a surge in levels of carbon dioxide. This is according to the World Meteorological Organization's annual Greenhouse Gas Bulletin, which injected even greater urgency into the need for concerted international action against accelerating and potentially devastating climate change. The amount of greenhouse gases in the atmosphere reached a new record high in 2013, propelled by a surge in levels of carbon dioxide. This is according to the World Meteorological Organization's annual Greenhouse Gas Bulletin, which injected even greater urgency into the need for concerted international action against accelerating and potentially devastating climate change. The Greenhouse Gas Bulletin showed that between 1990 and 2013 there was a 34% increase in radiative forcing -- the warming effect on our climate -- because of long-lived greenhouse gases such as carbon dioxide (CO2), methane and nitrous oxide. In 2013, concentration of CO2 in the atmosphere was 142% of the pre-industrial era (1750), and of methane and nitrous oxide 253% and 121% respectively. The observations from WMO's Global Atmosphere Watch (GAW) network showed that CO2 levels increased more between 2012 and 2013 than during any other year since 1984. Preliminary data indicated that this was possibly related to reduced CO2 uptake by Earth's biosphere in addition to the steadily increasing CO2 emissions. The WMO Greenhouse Gas Bulletin reports on atmospheric concentrations -- and not emissions -- of greenhouse gases. 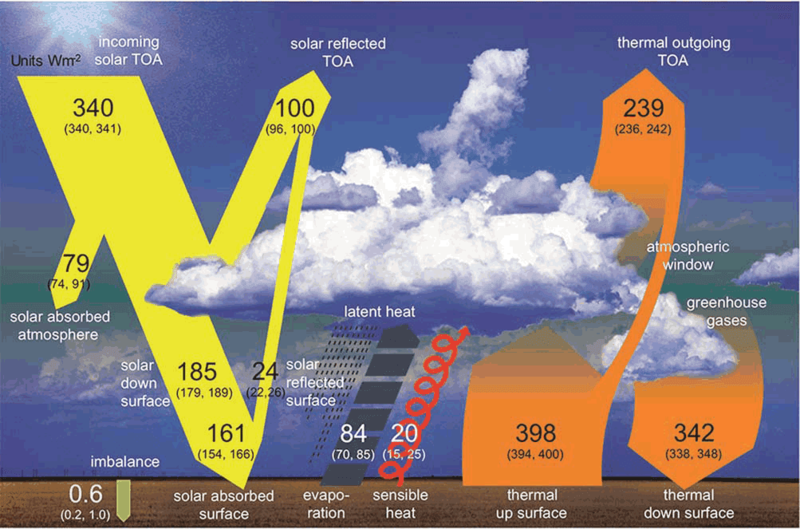 Emissions represent what goes into the atmosphere. Concentrations represent what remains in the atmosphere after the complex system of interactions between the atmosphere, biosphere and the oceans. About a quarter of the total emissions are taken up by the oceans and another quarter by the biosphere, reducing in this way the amount of CO2 in the atmosphere. The ocean cushions the increase in CO2 that would otherwise occur in the atmosphere, but with far-reaching impacts. The current rate of ocean acidification appears unprecedented at least over the last 300 million years, according to an analysis in the report. "We know without any doubt that our climate is changing and our weather is becoming more extreme due to human activities such as the burning of fossil fuels," said WMO Secretary-General Michel Jarraud. "The Greenhouse Gas Bulletin shows that, far from falling, the concentration of carbon dioxide in the atmosphere actually increased last year at the fastest rate for nearly 30 years. We must reverse this trend by cutting emissions of CO2 and other greenhouse gases across the board," he said. "We are running out of time." "Carbon dioxide remains in the atmosphere for many hundreds of years and in the ocean for even longer. Past, present and future CO2 emissions will have a cumulative impact on both global warming and ocean acidification. The laws of physics are non-negotiable," said Mr Jarraud. "The Greenhouse Gas Bulletin provides a scientific base for decision-making. We have the knowledge and we have the tools for action to try keep temperature increases within 2°C to give our planet a chance and to give our children and grandchildren a future. Pleading ignorance can no longer be an excuse for not acting," said Mr Jarraud. "The inclusion of a section on ocean acidification in this issue of WMO's Greenhouse Gas Bulletin is appropriate and needed. It is high time the ocean, as the primary driver of the planet's climate and attenuator of climate change, becomes a central part of climate change discussions," said Wendy Watson-Wright, Executive Secretary of the Intergovernmental Oceanographic Commission of UNESCO. "If global warming is not a strong enough reason to cut CO2 emissions, ocean acidification should be, since its effects are already being felt and will increase for many decades to come. I echo WMO Secretary General Jarraud's concern -- we ARE running out of time," she said. Carbon dioxide accounted for 80% of the 34% increase in radiative forcing by long-lived greenhouse gases from 1990 to 2013, according to the U.S. National Oceanic and Atmospheric Administration (NOAA) Annual Greenhouse Gas Index. On the global scale, the amount of CO2 in the atmosphere reached 396.0 parts per million in 2013. The atmospheric increase of CO2 from 2012 to 2013 was 2.9 parts per million, which is the largest annual increase for the period 1984-2013. Concentrations of CO2 are subject to seasonal and regional fluctuations. At the current rate of increase, the global annual average CO2 concentration is set to cross the symbolic 400 parts per million threshold in 2015 or 2016. Methane is the second most important long-lived greenhouse gas. Approximately 40% of methane is emitted into the atmosphere by natural sources (e.g., wetlands and termites), and about 60 % comes from human activities like cattle breeding, rice agriculture, fossil fuel exploitation, landfills and biomass burning. Atmospheric methane reached a new high of about 1824 parts per billion (ppb) in 2013, due to increased emissions from anthropogenic sources. Since 2007, atmospheric methane has been increasing again after a temporary period of leveling-off. Nitrous oxide is emitted into the atmosphere from both natural (about 60%) and anthropogenic sources (approximately 40%), including oceans, soil, biomass burning, fertilizer use, and various industrial processes. Its atmospheric concentration in 2013 was about 325.9 parts per billion. Its impact on climate, over a 100-year period, is 298 times greater than equal emissions of carbon dioxide. It also plays an important role in the destruction of the stratospheric ozone layer which protects us from the harmful ultraviolet rays of the sun. For the first time, this Bulletin contains a section on ocean acidification prepared in collaboration with the International Ocean Carbon Coordination Project (IOCCP) of the Intergovernmental Oceanographic Commission of UNESCO (IOC-UNESCO), the Scientific Committee on Oceanic Research (SCOR), and the Ocean Acidification International Coordination Centre (OA-ICC) of the International Atomic Energy Agency (IAEA). The ocean currently absorbs one-fourth of anthropogenic CO2 emissions, reducing the increase in atmospheric CO2 that would otherwise occur because of fossil fuel combustion. Enhanced ocean CO2 uptake alters the marine carbonate system and lead to increasing acidity. The ocean's acidity increase is already measurable as oceans take up about 4 kilogrammes of CO2 per day per person. The current rate of ocean acidification appears unprecedented at least over the last 300 million years, based on proxy-data from paleo archives. In the future, acidification will continue to accelerate at least until mid-century, based on projections from Earth system models. The potential consequences of ocean acidification on marine organisms are complex. A major concern is the response of calcifying organisms, such as corals, algae, mollusks and some plankton, because their ability to build shell or skeletal material (via calcification) depends on the abundance of carbonate ion. For many organisms, calcification declines with increased acidification. Other impacts of acidification include reduced survival, development, and growth rates as well as changes in physiological functions and reduced biodiversity. The summary on ocean acidification was jointly produced by the International Ocean Carbon Coordination Project (IOCCP) of the Intergovernmental Oceanographic Commission of UNESCO (IOC-UNESCO), the Scientific Committee on Oceanic Research (SCOR), and the Ocean Acidification International Coordination Centre (OA-ICC) of the International Atomic Energy Agency (IAEA). The above story is based on materials provided by World Meteorological Organization. Note: Materials may be edited for content and length. World Meteorological Organization. "Carbon dioxide concentration surges: Record greenhouse gas levels impact atmosphere and oceans, WMO report finds." ScienceDaily. ScienceDaily, 9 September 2014. .
Ahah! I've occasionally used that pH data from the Monterey Bay Aquarium, which I've gotten from them here, when posting on the ridiculous claims that (a) the oceans are becoming "more acidic," and (b) that they have detected a change of a couple of tenths of a pH unit, or some such nonsense. In no way do I think the Oceans are 'acidifying' but inaccurate statements do not help to educate people. Measuring ocean pH is notoriously difficult. From U. of Hawaii Oceanography lab. Agree 100% There are so many measurements that require proper and consistent calibration. Most human controlled measurement are flawed. so the rate of CO2 increase is then ~constant. Hmm…. That’s the period when temperature became ~constant. See Salby’s talk at the UK parliament around 19:20. Thanks I wasn't aware of that particular Salby video, and will watch it as soon as I have a chance. EIKE Member Siegfried Dittrich (PhD in physical chemist) puts the grotto some false reports in a letter to the WA cope again. A few weeks ago we were already announced by well-paid climatologists impending melting of the polar ice caps. According to communication from the World Meteorological Organization in Geneva will now go to meet by the constant CO2 emissions an inevitable acidification even the seas. Both are totally exaggerated statements that have nothing to do with sound science, and the term peak describes nothing more than a completely trivial facts. You might as well say, the slow-growing summit of Mount Everest is located every year to a new high. Less than 2 ppm (millionths of volume), the annual increase in CO2 due to fossil fuel consumption including illegal slash and burn. With currently 400 ppm are 0.5% with no apparent acceleration in the last year, as falsely claimed. This corresponds to a weight of around 15.5 billion tonnes. Something more than the same amount has been recorded in the last year to approximately equal parts of the oceans and the biosphere. The maritime CO2 increase was hereafter in this time is about 1 ppm. About the 20000-fold is already in sea water (50 times as much as in the atmosphere). Thus, the annual growth is a mere 0.005%. To reduce the current pH of 8.2 on average only 8.1 in sea water (which is still in the basic range would be), a dissoziationsbedingte increase the H ion concentration at 30% would be required. Every high school graduate and a fortiori every math teacher should be able to understand the light, when he knows that the pH is a decadic logarithmic number. In the above grotesque disproportion it is absurd to speak of a frightening ocean acidification. Equally wrong is the claim that CO2-related heat reflection has increased in the period from 1990 to 2013 by the continuous emissions by 27%. 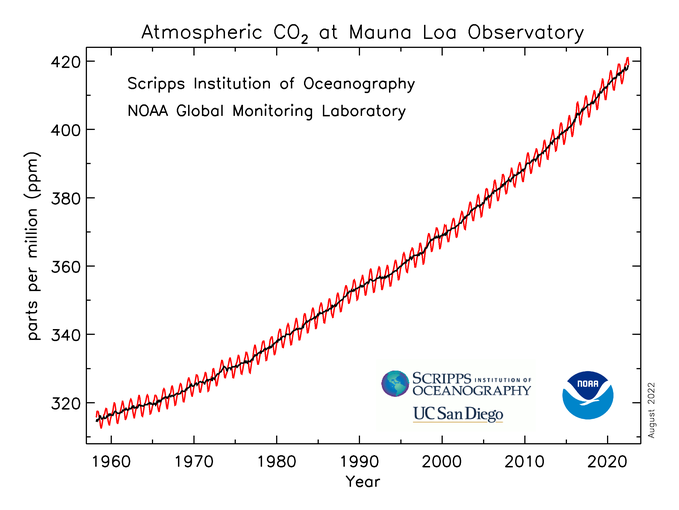 The CO2 increase was at this time 23 x 2 = 46 ppm. This corresponds to a backscatter increase of 0.65 W / m². More is not get out of the almost exhausted spectral range around the 15 micron line. 1990, caused by CO2 heat reflection was / m² at about 37 watts. The increase to 2013 was thus in reality only 1.8% and not 27%. Equally wrong is the statement that the acidity of the oceans today has the highest level since 300 million years ago. Had just begun the era of Perm, in the CO2 content of the atmosphere was almost four times as high as it is today and has thus impacted accordingly in the seas. The last false statement is that the man threatened by the use of fossil fuels without any doubt the Earth's climate. So far he has only taken a completely insignificant influence with 0.2 ° C, which I have already proven several times in numerous letters to the editor. The time has come, our energy policy again as quickly as possible due to the original level before the barely saving trillion euros is spent entirely.